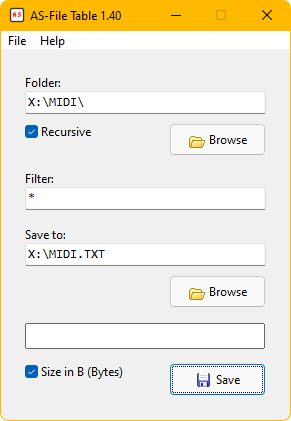 AS-File Table 1.40 - Create text-only tables of files. A program to search through a folder and get a text-only table of its files and its size. Aware of the length of all fields, which means that the columns do not become larger than necessary. Can print the file sizes either with B (Bytes) or with dynamic expression (B, kB, MB, GB, TB, PB, EB).